Page Street Publishing, 9781624145582, 192pp. When craft time rolls around, parents usually cringe at the thought of a creativity storm’s aftermath. Glue, glitter, globs of paint—it all adds up to Mom and Dad assisting (let’s be honest, doing everything) with cleanup. But Debbie Chapman—the supermom behind One Little Project —keeps that freshly cleaned kitchen table in mind with tips to keep these tutorials as mess-free as possible. With tricks like twisting pipe cleaners into fun shapes to avoid glue and using brightly colored cups and patterned paper to avoid paint, Debbie shows that keeping it simple doesn’t mean play time has to be less fun. Watch as little ones create their own enchanting worlds—whether they want to explore outer space with a Paper Plate Flying Saucer, race cars on a Poster Board Road Track, or create a whimsical fairy city with Paper Roll Fairy Houses, each craft promises to spark your child’s imagination while leaving you stress free and ready to play along. 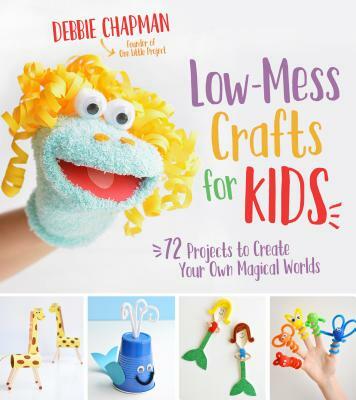 DEBBIE CHAPMAN is the creator of One Little Project, a blog which offers everything from kids crafts to home organization tips to delicious recipes. She lives in London, Ontario, Canada.